If you have an outdoor adventure planned, you NEED these genius camping hacks to make sure your fun isn’t ruined. There’s nothing quite like getting away from it all and go camping. 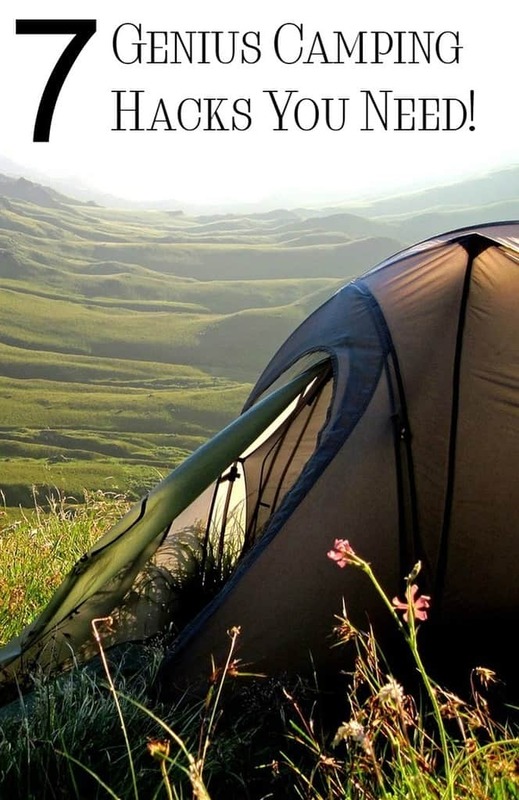 Camping gives you with the chance to breath in some fresh air and engages in some fun activities like hiking and swimming. Unfortunately, with all that outdoor fun also comes outdoor menaces: bugs, heat, the potential for injuries. Nothing ruins a camping trip faster than getting eaten alive by insects or losing the entire weekend’s meal rations to a bear! Check out these camping hacks that will keep your trip from going up in the bonfire smoke! Who doesn’t love bonfires? The problem is that most of the time, mosquitoes interfere with our ability to enjoy the fire. To repel mosquitoes, add some sage to your fire and the scent will keep mosquitoes at bay. If you or someone in your family gets a tick on them, squeeze some dish soap on a cotton ball, place it on the tick and hold in place for 25 seconds. This will cause the tick to stick to the cotton ball. You want some tasty scrambled eggs for breakfast but don’t want the hassle or mess of lugging around a cartoon of eggs right? Just crack your eggs into a water bottle, storing up to 8 eggs. This will save you time from having to crack them, and you don’t need a bowl or a whisk. Check out more ideas for camping food! Not a meat eater? Try our vegetarian camping meals. Yes, sandpaper can be used to light matches with ease. How you ask? Just glue a square of sandpaper to a small container lid, store the matches inside the container and you have an instant match lighter. Part of camping is having a cozy bonfire. However, this may not always be an easy task since starting the fire can be difficult at times. If you have corn chips, then you have an easy way to start a fire. Need some light but don’t have a lantern available? All you need is an empty and clean tuna fish can and a votive candle. Then, just place the candle in the can and voila, you have light. If you’re camping with toddlers, bring Ziplock bags or other airtight containers for storing dirty diapers and clothes. Nothing draws bugs (or stinks up the tent!) faster than a nasty diaper. These camping hacks will make your trip go a lot smoother, so even the skeptics among your family will enjoy the trip. If you have young children and want to do a trial run, check out our ideas for taking a “real” camping trip in your back yard! Of course, if you want to get really away, you can’t do much better than camping in Yellowstone in the US or these National Parks in Canada! I love the idea of adding sage to the campfire. I may have to try this the next time that I have an open fire in my yard. Love finding new hacks!! I love going camping and hope we are able to get more in this summer then we have in the past couple years. Will definitely be trying the tick removal idea. We always end up with one or two when we go morel hunting! I haven’t been camping for ages! I really like the eggs and sandpaper tips! Never would have thought of that! I have a friend who goes camping frequently, so will share these hacks with him. WHat? That sandpaper trick is brilliant. I’m totally remembering that. I have not gone camping in years! My kids are all grown up and they have their own activities. Maybe when the grandkids are a little older, we can pitch a tent in the backyard and do some camping activities. too. Camping is always cool, especially when kids are experiencing it as part of their childhood, great fun! We’ve been camping quite a number of times. Mosquitoes are the absolute worst! I have not been camping so these tips are super helpful to me. My daughter is going camping this summer and I will need help getting her ready! We were just talking about going camping again. We haven’t been camping in ages. These are all such great tips. The last time I went camping, I was a teenager. Lol. I can’t believe it’s been that long, would be nice to do it again, this time with my daughters.